Something that looks closely related to the recent exchange between Mark and Steve about the justification of religious liberty as obstructive of the government’s power — Limited Government and the Bill of Rights (University of Missouri Press 2012), by Patrick M. Garry (University of South Dakota). The publisher’s description follows. What was the intended purpose and function of the Bill of Rights? Is the modern understanding of the Bill of Rights the same as that which prevailed when the document was ratified? In Limited Government and the Bill of Rights, Patrick Garry addresses these questions. Under the popular modern view, the Bill of Rights focuses primarily on protecting individual autonomy interests, making it all about the individual. But in Garry’s novel approach, one that tries to address the criticisms of judicial activism that have resulted from the Supreme Court’s contemporary individual rights jurisprudence, the Bill of Rights is all about government—about limiting the power of government. In this respect, the Bill of Rights is consistent with the overall scheme of the original Constitution, insofar as it sought to define and limit the power of the newly created federal government. Garry recognizes the desire of the constitutional framers to protect individual liberties and natural rights, indeed, a recognition of such rights had formed the basis of the American campaign for independence from Britain. However, because the constitutional framers did not have a clear idea of how to define natural rights, much less incorporate them into a written constitution for enforcement, they framed the Bill of Rights as limited government provisions rather than as individual autonomy provisions. To the framers, limited government was the constitutional path to the maintenance of liberty. Moreover, crafting the Bill of Rights as limited government provisions would not give the judiciary the kind of wide-ranging power needed to define and enforce individual autonomy. With respect to the application of this limited government model, Garry focuses specifically on the First Amendment and examines how the courts in many respects have already used a limited government model in their First Amendment decision-making. As he discusses, this approach to the First Amendment may allow for a more objective and restrained judicial role than is often applied under contemporary First Amendment jurisprudence. Limited Government and the Bill of Rights will appeal to anyone interested in the historical background of the Bill of Rights and how its provisions should be applied to contemporary cases, particularly First Amendment cases. 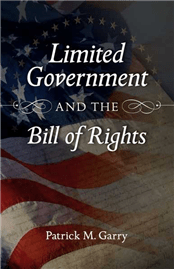 It presents an innovative theory about the constitutional connection between the principle of limited government and the provisions in the Bill of Rights.